Is anymore equipment going to get moved from Forest Park this year? Are any of the new owners going to liberate thier engines cars and so forth from Forest Park, Noblesville this year? The year is quickly coming to to an end, next week is the first week of October. Seems like its been mostly silence since the last min ditch effort to move stuff prior to the gates being locked up. Re: Is anymore equipment going to get moved from Forest Park this year? 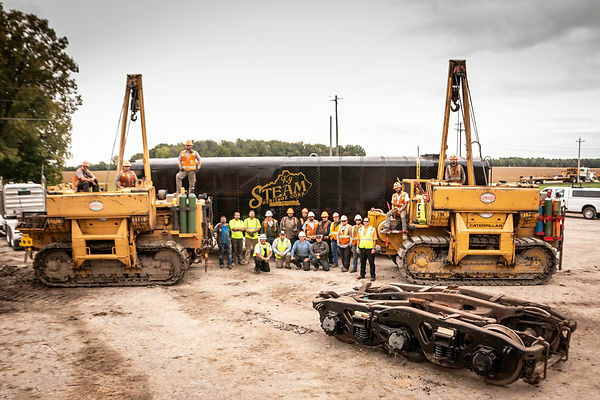 The three cars were acquired earlier this year by Kentucky Steam from the Indiana Transportation Museum, which vacated its location at Forest Park in Noblesville, Indiana. The cars acquired are ex- Pennsylvania Railroad Railway Post Office car 6565 and Baggage Car 9036 - both located at the former ITM site - and auxiliary water tender 220166 which was located off site. I just seen they got their cars moved over on a FB group I am a member of. Atleast some of the new owners are getting thier stuff moved. ITM needs to take a really hard look at how they have operated, and how this group in KY operate. They could learn a few things. This group in KY looks to have their act together, from operations to fund raising and winning grants from the state and feds. It can be done. Hope to see some of the diesels moved soon. Hope the owner of Monon DS50 drained her cooling water as freezing weather isnt far away. We all seem to be concerned about the rolling stock and that's fine. I'm still interested in other artifacts and ephemera. Can't find a knowledgeable source to tell me about all the telephone equipment that was in the D&H coach or whether all the maps, drawings and diagrams in there were saved. The person who donated a collection of employee timetables told me that he went out in July and retrieved many of them from the refrigerator car but said he left a lot behind. Much of that may have ended up on Ebay. I hope the city of Noblesville lets someone with some knowledge go in and look at what was left behind so they can find things a deserving (non-profit) home. Ralph, I hope so too. But i do have to think that it's probably all trash now. I can personally report that during the last frantic week those "Storage" reefer boxcars that were full of ephemera were open to the elements, and completely trashed, like scavengers had been going through them, haphazardly throwing things about. The only reason I stopped to take a closer look was a rolled up vellum (that's that old old blueprint paper) made an odd noise in a breeze as I walked by, and I stopped to take a look at it. was a plan for a PRR cross buck. just blowing around in the wind. 1 Like Ralph likes this. The water tender stored at the 249th Steet siding was removed yesterday by the Kentucky group with assistance from Atlanta Pacific Rail. NOBLESVILLE, Ind. — A Pennsylvania Railroad combine, baggage car, and Louisville & Nashville auxiliary water car are the three latest pieces of rolling stock headed for the Kentucky Steam Heritage Corp., in Ravenna, Ky.
Kentucky Steam Heritage officials are collaborating with Hulcher Services, a railroad mechanical contractor, and CSX Transportation to relocate the three historic railcars from Noblesville, Ind., to eastern Kentucky. The cars were previously part of the Indiana Transportation Museum’s collection in Noblesville. The cars are former Pennsylvania Railroad Railway Post Office Car No. 6565, Pennsylvania Railroad baggage car No. 9036, and ex-Louisville & Nashville auxiliary water tender No. 220166. The L&N water car was stored offsite, while the two Pennsylvania cars were part of the Noblesville collection. Hulcher crews recently helped transport the railcars by truck several miles to a nearby CSX rail line where they’re being re-assembled and inspected for shipment by rail. Chris Campbell, president of the Kentucky Steam Heritage Corp., says the an exact departure date from central Indiana is unknown. A routing for the cars was not indicated either. Future plans for the railcars include using the Pennsylvania combine as a tool and crew car for steam operations. It has already been retrofitted by the Indiana museum for similar use behind Nickel Plate Road No. 587. The group also intends to use the auxiliary water car for similar steam operations, including increased operational capacity for Chesapeake & Ohio No. 2716. The water car was originally the tender for L&N No. 1958 before it was retrofitted in 1982 as a water and tool car for Norfolk Southern’s steam program. It was retired by NS in 1988 and donated to the Indiana Transportation Museum shortly thereafter. The group is still identifying a use for the former Pennsylvania Railroad baggage car. Stuff will be moving out on a case-by-case basis. Work behind the scenes as always.